For other ghosts, see Ghost (disambiguation). 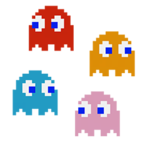 In-game sprites of Blinky, Pinky, Inky, and Clyde from Pac-Man. Blinky, Pinky, Inky, and Clyde (アカベエ, Akabei, ピンキー, Pinky, アオスケ, Aosuke, and グズタ, Guzuta), collectively referred to as Ghosts (モンスターズ, Monsters), are recurring enemies in the Pac-Man series. They are red, pink, cyan, and orange, respectively. The attract mode of Pac-Man gives names to the ghosts. The four ghosts have become recurring elements in the Pac-Man series. Their appearance is based off of the 8-bit sprites from the original Pac-Man. Their movement patterns are also based off of the original game: Blinky follows Pac-Man, Pinky ambushes Pac-Man between her and Blinky, Inky aims for a location based on Blinky's distance from Pac-Man, and Clyde emulates Blinky's movement pattern but steers himself into the lower left corner when he comes close to Pac-Man. Twice per round, Blinky speeds up after a certain amount of dots are eaten; this behavior is incorporated into the ghosts' Assist Trophy by having them speed up over its duration. 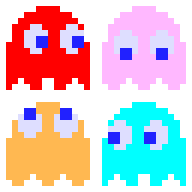 While additional ghosts have made appearances in subsequent Pac-Man titles, the four introduced in the original arcade title have remained the most iconic, and thus have made the most appearances. The Ghosts appear in three major capacities in these games. The Ghosts as an Assist Trophy. When summoned via an Assist Trophy, the Ghosts will wander around the stage trying to make contact with an opponent fighter. They deal 10% damage, cannot be shielded, and speed up several seconds before they despawn, notified by a change in pitch of their "wandering" tone. Unlike other Assist Trophies, they simply zoom offscreen instead of disappearing. 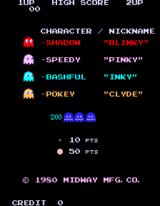 Each ghost exhibits similar behavior as they did in the original arcade game: Blinky takes the shortest route to nearby enemies, Pinky tries to move in front of them, Inky moves opposite to Blinky, and Clyde moves randomly. Pac-Man uses the Ghosts for his smash attacks, holding Blinky in front of him for his forward smash, Inky above him for his up smash, and Pinky and Clyde on either side of him for his down smash. The Ghosts are considered to be disjointed hitboxes, and as a result, hitboxes that hit them do not harm Pac-Man himself. Ghosts also appear in two of Pac-Man's taunts. Pac-Man's up taunt Namco Roulette can summon a scared ghost in Super Smash Bros. for Nintendo 3DS, while Blinky and Pinky appear in his down taunt. Blinky in Pac-Man's forward smash. Inky in Pac-Man's up smash. Pinky and Clyde in Pac-Man's down smash. Blinky and Pinky in Pac-Man's down taunt. A scared ghost in Pac-Man's up taunt. The Ghosts appear as damaging hazards on the Pac-Maze stage. By collecting 100 Pac-Dots, a player can spawn a Power Pellet and therefore make them vulnerable, though they remain dangerous to other players. The single and collective Ghosts trophies appear in both versions, while the TURN-TO-BLUE trophy is exclusive to Super Smash Bros. for Nintendo 3DS. In Super Smash Bros. for Wii U, the single and collective trophies are part of the PAC-MAN and SUPER PAC-MAN & PAC-LAND Trophy Boxes, respectively. Ghosts (PAC-MAN) Each of the four types of ghost in PAC-MAN behaves a bit differently. In Smash Bros., they appear in 8-bit form and move around the stage in their own quirky way, tormenting the fighters. The longer they chase you, the faster they move—and even if you get a Power Pellet and defeat them, they'll be back soon enough! Each of the four types of ghost in PAC-MAN behaves a bit differently. In this game, they appear in 8-bit form and move around the stage in their own quirky way to torment the fighters. The longer they chase you, the faster they move - and even if you get a Power Pellet and defeat them, they'll be back soon enough! Blinky A red ghost that chases after PAC-MAN in the PAC-MAN series. The way he incessantly follows PAC-MAN earned him the nickname Shadow. When you get further in the stage, he also gets a terrifying speed boost! In Smash Bros., he appears in the PAC-MAZE stage and in PAC-MAN's side smash. A red ghost that chases after PAC-MAN in the PAC-MAN series, noted for the way incessantly follows PAC-MAN. When you get further in the stage, he also gets a speed boost, which can be quite terrifying! In this game, he appears in the PAC-MAZE stage and in PAC-MAN's side smash. Inky A blue ghost that chases after PAC-MAN in the PAC-MAN series…sometimes. He's also known as Bashful, since he moves around indecisively depending on whether PAC-MAN is nearby. In Smash Bros., he appears in the PAC-MAZE stage and in PAC-MAN's up smash. A blue ghost that chases after PAC-MAN in the PAC-MAN series...some of the time. He has a tendency to move around indecisively depending on whether or not PAC-MAN is nearby. In this game, he appears in the PAC-MAZE stage and in PAC-MAN's up smash. Pinky A pink ghost that strategically targets PAC-MAN in the PAC-MAN series. She's also known as Speedy, as she can anticipate PAC-MAN's moves and get ahead of him quick enough to ambush him. In Smash Bros., she appears in the PAC-MAZE stage and in PAC-MAN's down smash. A pink ghost that strategically targets PAC-MAN in the PAC-MAN series. She can anticipate PAC-MAN's moves and get ahead of him quick enough to ambush him with a pincer attack. In this game, she appears in the PAC-MAZE stage and in PAC-MAN's down smash. Clyde An orange ghost that doesn't really chase after PAC-MAN all that much in the PAC-MAN series. Instead, he likes to just wander around, doing his own thing. He's also known as Pokey, and in PAC-LAND he appears as a tough and speedy enemy. In Smash Bros., he shows up in the PAC-MAZE stage and in PAC-MAN's down smash. An orange ghost that doesn't really chase after PAC-MAN all that much in the PAC-MAN series. Instead, he chooses to just wander around, doing his own thing. In PAC-LAND he appears as a tough and speedy enemy. In this game, he shows up in the PAC-MAZE stage and in PAC-MAN's down smash. TURN-TO-BLUE The colorful ghosts in PAC-MAN generally act as pursuers, chasing down the hero as he searches for food. But feed the hero a Power Pellet, and now it's the ghosts' turn to run! They take on this new form as they run for their ghostly lives. In Smash Bros., these scaredy-ghosts will appear in the PAC-MAZE stage if you grab a Power Pellet. The colourful ghosts in PAC-MAN usually act as pursuers, chasing down the hero as he goes in search of food. But feed him a Power Pellet, and now it's the ghosts' turn to run! They take on this new form as they flee for their ghostly lives. In this game, too, you can see the ghosts in this form if you grab a Power Pellet in the PAC-MAZE stage. The Ghosts as an Assist Trophy in Ultimate. The Ghosts reprise their role as an Assist Trophy and as part of Pac-Man's moveset in Super Smash Bros. Ultimate. In their Assist Trophy appearance, the background now turns blue when they appear, and they can now be attacked and defeated. When one of the four ghosts is defeated, the ghosts will turn to blue and the other three ghosts will run away. Additionally, a vulnerable ghost still appears in Pac-Man's Namco Roulette taunt. However, Blinky and Pinky no longer appear in his down taunt, being replaced by fairies from Pac-Land. This page was last edited on April 20, 2019, at 01:49.